Eight students from Marton Primary Academy are published authors, as their poems were chosen to be part of a book by Young Writers. 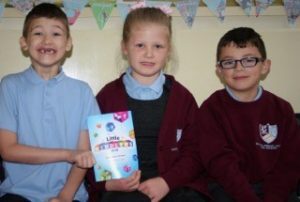 The organisation published the Little Riddlers poetry books as part of a nationwide competition, and Marton’s bards were chosen to feature in the “Lancashire Verses” version of the book, which is now available at the school library and to buy in shops and online. Well done to Tayla Jones, Isla Gelder, Harrison James Birtle, Luke Roberts-Wilson, Rebeka Rozenfelde, Mia Shelliker, JD John and Aiden Howard.